Home > Used Vehicles > 2014 GMC Terrain SLT-1,V-6,LEATHER,AWD,ALUMINUM WHEELS,AIR,TILT,CRUISE,PW,PL,BLUETOOTH,VERY CLEAN!!! 2014 GMC Terrain SLT-1,V-6,LEATHER,AWD,ALUMINUM WHEELS,AIR,TILT,CRUISE,PW,PL,BLUETOOTH,VERY CLEAN!!! Cylinders: 3.6L V6 24V GDI DOHC - 6 cyl. Leather Seats, Air, Tilt, Cruise, Power Windows! Hurry on this one! Marked down from $23900 - you save $4276. 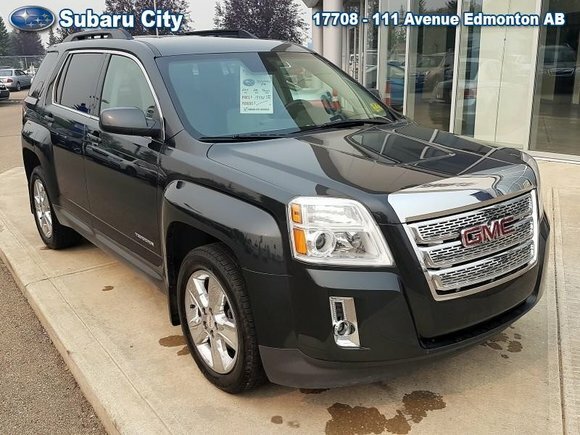 This 2014 GMC Terrain is for sale today in Edmonton. The 2014 GMC Terrain is a compact crossover SUV that is spacious, comfortable, and offers both the power and performance you're looking for. Its rugged exterior styling looks the part of the GMC family and the roomy interior offers luxury touches and room for five. Passenger and driver alike will appreciate the quiet cabin of the GMC Terrain. With a rugged, yet classy exterior and a comfortable, high-tech interior, the GMC Terrain is a premium compact SUV without a premium price tag. This SUV has 92717 kms. It's carbon black metallic in colour. It has an automatic transmission and is powered by a 3.6L V6 24V GDI DOHC engine. This vehicle has been upgraded with the following features: Leather Seats, Air, Tilt, Cruise, Power Windows, Power Locks, Power Mirrors. It may have some remaining factory warranty, please check with dealer for details. Buy this vehicle now for the lowest bi-weekly payment of $147.35 with $2144 down for 72 months @ 5.99% APR O.A.C. ( taxes included, $790 Administration and Secure Ride included / Total cost of borrowing $3696 ). See dealer for details. Want to try the 2014 GMC Terrain SLT-1?